I had never heard of these before, although they sounded great because I love a good Hawaiian pizza…. so if it is anything like that I was sure I would love it! Brian assured it me it was a real thing and it was good! 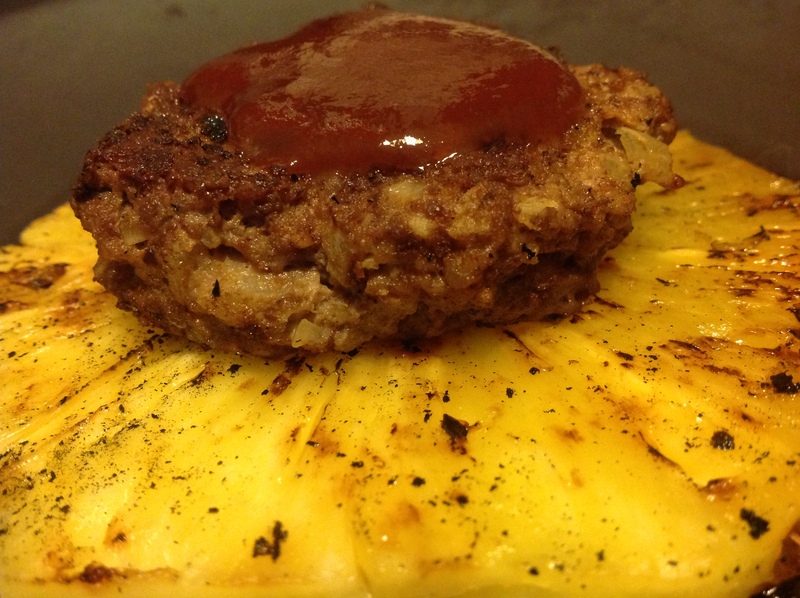 Brian said it was a hamburger on top of a piece of grilled pineapple with sweet and sour sauce on top! Hmmm… sounds decent… so I gave it a try! We all loved it… but really… sweet hamburgers… what’s not to like about it! I took a whole fresh pineapple, cut the top and bottom off and the sides as well. Then I sliced it in rings and carefully cut out the core. Brian took them out on the grill and toasted them on both sides as he was grilling the hamburgers. After that, there was just the sauce to add and a dinner to enjoy! This was super simple and very easy to make. It probably took all of 30 minutes and the majority of the cooking Brian did on the grill for me! Pat into 4 large patties and 3 minis and grill! Bring sauce to a boil in a saucepan. Sauce will continue thicken as it cools. This was a huge favorite and will be used again and again! We didn’t even miss having any bread! We also didn’t need anything else on top but the sweet and sour sauce and the kids didn’t even ask! I served it with sweet potato fries and a small side salad. Mmmm! That’s all I can say!